Capt. Rosemary Hogan, graduated from Chattanooga High School. 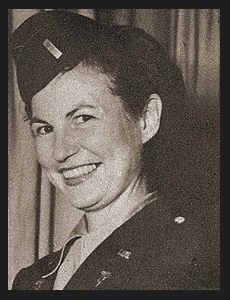 Entered Army Nurses Corps in 1939, trained in Temple, Texas; served in Corregidor and Bataan, was taken prisoner in May, 1942, released in April, 1945; served in Coral Gable, Fla. Received the Purple Heart, Bronze Star, Legion of Merit, Asiatic Pacific Ribbon.